ClearVoice, a collaborative content management platform, explores the biggest challenges of marketing content in their new survey. The poll uses open-ended responses from 1,000 marketers to provide insight on challenges like time, content quality and creation, idea generation, and distribution. The simple question, “What’s your biggest challenge with content?” yielded a variety of responses and identified the various elements of a successful marketing campaign, including reaching the appropriate audience and channels—in addition to crafting content that shows genuine passion and credibility. The survey notes the word “time” as the most frequent single-word submission, highlighting the numerous ways that time can impact the marketing process. Time is where most of the difficulties arise inherently, although many of the responses highlighted specific instances that lead marketers to feel as if there’s not enough daylight. Disorganization, an over-abundance of goals, and poor collaboration can all lead to the feeling of a time crunch. Organization can help create more room for great ideas and content creation, with time and organization going hand-in-hand. Time significantly outweighs management and planning as a challenge. Examples of time-related challenges include scheduling the calendar, managing the review process, involving all stakeholders, and collaborating with various departments. Marketers feel challenged when trying to come up with original ideas. Even when you have an original idea, it can be difficult making that idea compelling for readers. You need an idea that is not only original but also appealing to the target demographic, as well. It’s not a surprise that 27 percent of respondents find producing creative content to be the biggest barrier to getting in touch with their creative side. Marketers spend ample time trying to make their content feel genuine while also being clear and concise. Some brands have upped their engagement by intertwining original ideas with compelling storytelling, helping make abstract ideas more tangible for their audience. Airbnb accomplishes both innovation and storytelling in immersive form, via Airbnb community stories, which they integrate across various marketing platforms and campaigns, such as the “Belong Anywhere” campaign. Airbnb shows they value their users’ artistic and giving nature—a great strategy for a business whose infrastructure is fueled by users providing homes and seeking places to stay. 51 percent of marketers cite content quality as the biggest challenge to establishing credibility—more than twice that of engagement. Naturally, quality content tends to engage, hence the 51 percent to 23.6 percent difference. Titan Alarm is one example of a brand that provides a good range of quality content on their blog. It features a mix of how-to posts, local guide posts, and posts capitalizing on recent trends. Each post appears well-researched and is accompanied by helpful visuals that help readers more easily digest the information presented. Feeling genuine is another challenge for content creators—often a difficult quality for corporate entities to capture. Still, several brands achieve a very genuine feel regarding their credibility, especially when showcasing their passion. For example, Asana’s marketing goes a great job of establishing genuine credibility. Their site lets visitors know NASA, General Electric, and Airbnb use their product, immediately establishing credibility. Their product tour uses a NASA space mission as the project example, reinforcing the NASA collaboration and showing passion in the uniqueness of each user. For marketers worried about hitting their KPIs, six in 10 marketers point to lead generation or conversion as the biggest challenge. By establishing credibility and showing passion for their niche, marketers can better turn content to conversions while delivering ROI. There’s such an abundance of content channels that marketers rarely referenced them by name in the survey. Google has one mention; Facebook has two mentions. (Marketers seem more focused on social sharing in general instead of individually specifying channels.) The survey audience specified a number of traffic challenges, including virality, reaching their audience, and being visible on search and social media. Producing viral content is a common aim among marketers. Mercedes-Benz achieves viral success with its #MBPhotoPass campaign, which began in 2014. The company provides social media influencers with the keys to a Benz, helping them tell a story using the vehicle. In recent years, they utilized YouTube’s 360-degree video technology, shown in this video featuring Instagram celebrity dog Loki. The campaign generated 173 million impressions and 2.3 million likes/comments. The ClearVoice survey revealed time, content quality and content, scaling content, idea generation, talent, distribution, and strategy to be the biggest challenges to marketing content, in order of mentions. (Time earned the most mentions.) 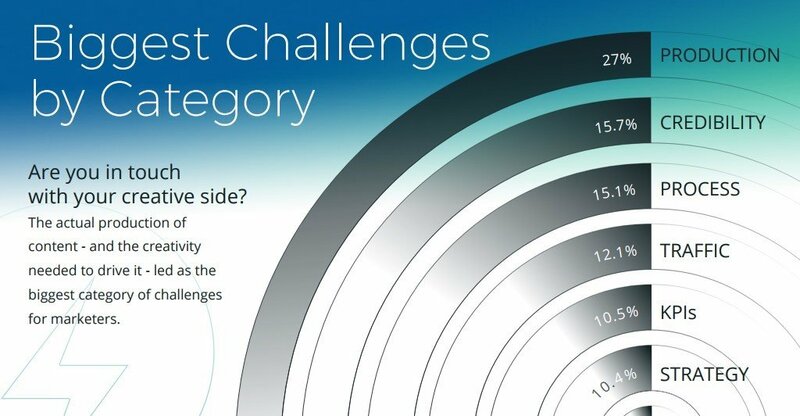 Keep in mind, marketers were asked to cite their “biggest challenge”—not their only challenge. Marketers and brands continue to overcome these challenges, as shown in the above examples, but difficulty remains when it comes to time management, producing content, and establishing credibility across a variety of channels.